I’ve returned to Cafe Reem in Harborne many times over the last couple of years and it really is one of my favourite places to eat at lunchtime. It’s also a great choice for a coffee and a cake, but for me if I’m popping in to meet up with a friend I usually opt for one of their magnificent Mint Teas rather than coffee. There’s so much emphasis on coffee in cafes these days that tea often gets forgotten or alternatively some good quality teabags are used, but a premium price (similar to the more pampered coffee) requested for the privilege. 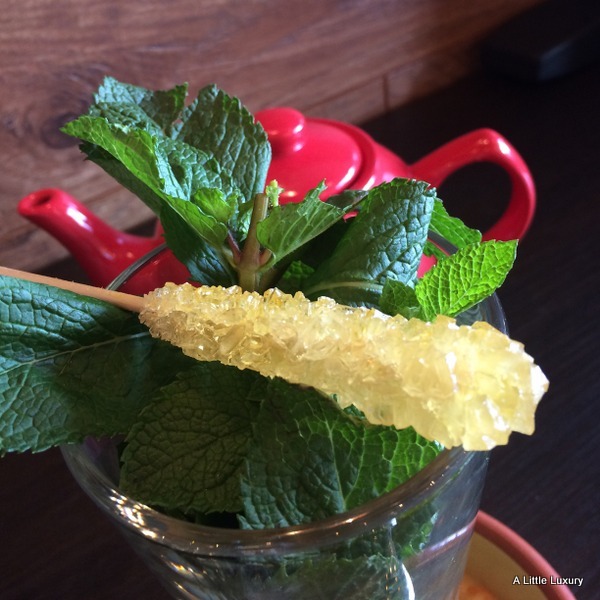 Cafe Reem is different because tea there is fresh and really an art form in its own right. Not only that but you get plenty of hot water provided, so your tea lasts for the duration of your catch up, which is just the way it should be. Cafe Reem isn’t just about the tea though. There’s a lot more to sample and enjoy. With its focus on Middle Eastern cuisine it’s perhaps no surprise that falafel is a speciality and well worth sampling. It’s prepared with care with a well judged combination of spices to create aromatic and flavoursome falafel. 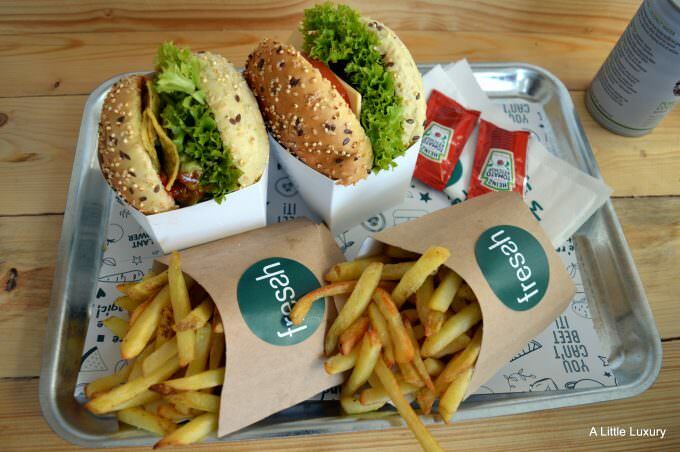 My personal favourite is the Falafel Burger which is good size for a filling lunch. It comes with a centre of goat cheese, sumac, and caramelized onions plus it’s served with hummus, imhamara and salad. There are a range of sandwich options available with falafel fillings and they are just as good, but a little smaller on the portion side if you want a lighter lunch. For my next visit I’m eyeing up the brunch menu which looks perfect for a leisurely weekend breakfast when you don’t have any particular plans for the day. There are a number of dishes with eggs that have caught my eye including O’jah, a Palestinian omelette, and Shakshuka, a one pot egg dish made with peppers. Update: I went to Cafe Reem a few weeks ago (writing this in October 2018) with two friends and was disappointed. I’d raved about the cafe to them and felt very embarrassed by the customer service: an order forgotten; an order got slightly wrong; a lot of grief about a slightly torn bank note; and a disappointing reaction to a hair in a dish (not sure where the hair had come from, but I didn’t like the way the issue was handled). I do expect to go again with other friends, so I’ll know better if it was a once off then. For some time now Bearwood (a suburb about 4 miles from the centre of Birmingham) has been a bit of a hot spot for local restaurants that have something different to offer. Like anywhere else within the West Midlands, it has its fair share of curry houses with a few Chineses, pizza takeaways and chip shops thrown in, but there are plenty more including a few decent Italians, an Austrian restaurant (currently closed sadly), a Persian and an Eastern European grill. In recent months a number of cafes have opened up mostly on the main high street (Bearwood Road) offering a range of offerings and it’s pleasing that these have been mostly independent outlets. The other day I tried out the latest cafe opening called Why Not Coffee with a friend. Inside there’s a soft industrial decor with wooden tables, metal vintage milk churns and some leather armchairs. We wanted to sit somewhere comfortable and luckily there was a suitable spot for us There are also some big tables with high stools which would be great for a meeting or for home workers. They do provide free Wifi and every seating area has a power socket and USB charger, but I didn’t try these out on my visit. I’d have preferred a little more softness to the decor, as I find that works well in a cafe as it helps absorb some of the noise, but Why Not Coffee has a very clean look and a pleasant atmosphere. There is a spacious, clean and well equipped toilet at the back, but you do need to go up a few steps to get to it. Within the main cafe, I noticed a thoughtful box of things for children, including drawing materials and books. Now neither of us are coffee drinkers, but we didn’t let the cafe name put us off. The tea was nicely presented with the milk in miniature metal milk churns. 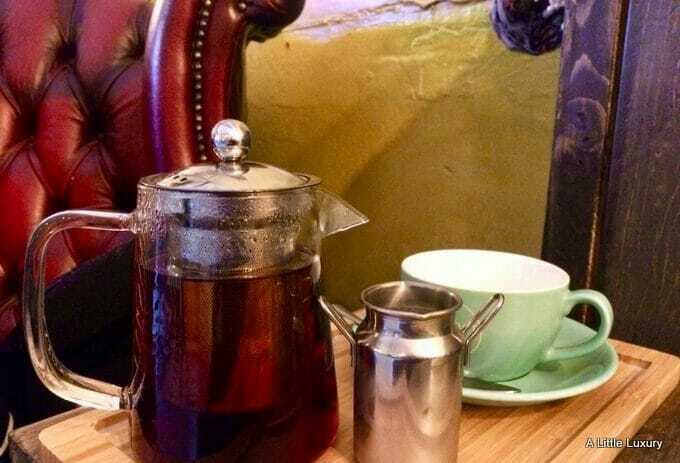 Like many cafes, there seems to be a desire to charge a similar price for tea to coffee, often without the justification in terms of quality or range. The tea was perfectly pleasant, but fairly ordinary, so it felt a bit pricey. We were provided with some extra hot water though when we asked, so that did help ease things along. In the interests of research I tried out one the cakes. It was a difficult choice because there were quite a few tempting options available. My carrot cake was delicious and very moist. I thought the cakes were reasonably priced too. There are some lunch options available and the bread on display did look nice, so maybe I’ll try some on another visit. 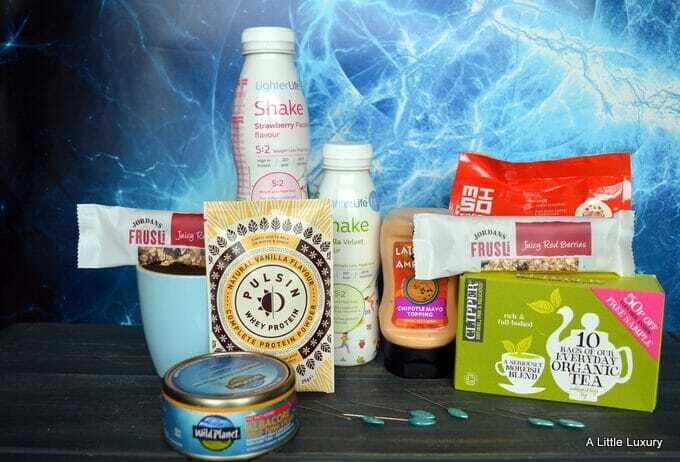 This month’s Degustabox has a new year, new me theme with lots of healthy options in the box, but there are also some nice treats too, so it should clear away any post-Christmas gloom. I’ve been out doing plenty of walking and I find that the Mahtay Yerba Mate Sparkling Tea is a good size to take when I am out and about. It’s a light sparkling drink that gives you energy too. Another great companion for a walk is the Pulsin Vanilla Choc Chip Protein Booster which is a handy taste bar containing 13g of plant based protein. Back at home I used the Pulsin Vanilla Whey Protein Powder for adding a protein boost. Explore Cuisine Organic Edamame & Mung Bean Fettuccine is a great way of adding extra protein and fibre to your favourite pasta dishes. January is a time when many of us are looking to try to lose a little weight. I was interested to try the LighterLife Fast Ready to Drink Shakes, available exclusively from Superdrug, but I found the shakes a little sweet for my taste, but I am interested in trying the rest of the range. Eating more oily fish is something I’ve been trying to do and my go-to sources are mackerel and tuna. Wild Planet Albacare Wild Tuna Steaks are 100% pole and line caught. They are cooked once to retain the natural juices in the tin, so don’t drain and use the Omega-3 rich juices to enhance the flavour and your nutrition. Clipper Tea has long been a favourite of mine. Clipper Everyday Organic Tea makes a really good cuppa and it’s organic and the teabags are unbleached. Also keeping me going this month have been the Jordans Juicy Red Berry Frusli Bars made with handfuls of zingy cranberries and raisins. Hersheys Cookies N Creme 5 Pack Snack Pack have provided a very welcome sweet treat. I love noodles for a quick and tasty meal so the Miso Tasty Spicy Ramen Noodle Kit was very welcome. A little spice got added to our meals through the Latin American Kitchen products from Santa Maria: Chipotle Mayo Topping and Colombian Crunchy Chicken Bites Seasoned Corn Coating. A refreshing contrast was provided by the Robinsons Fruit Cordial with a more sophisticated mix of fruits than the average cordial. 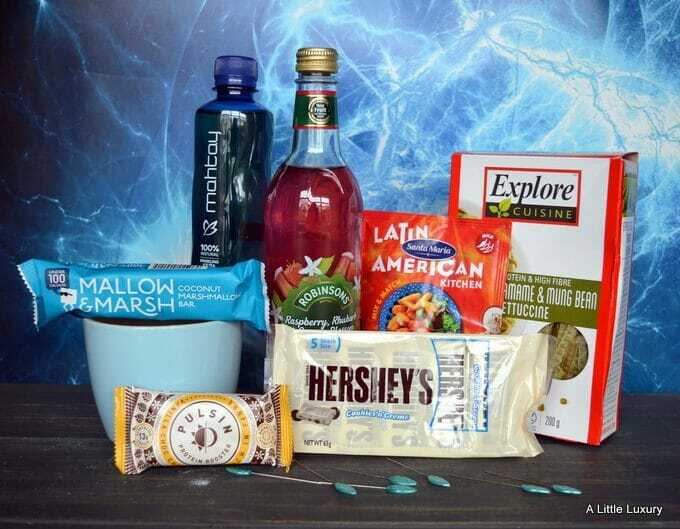 You can buy a Degustabox here and get a monthly box of food to help you discover new tastes and brands. 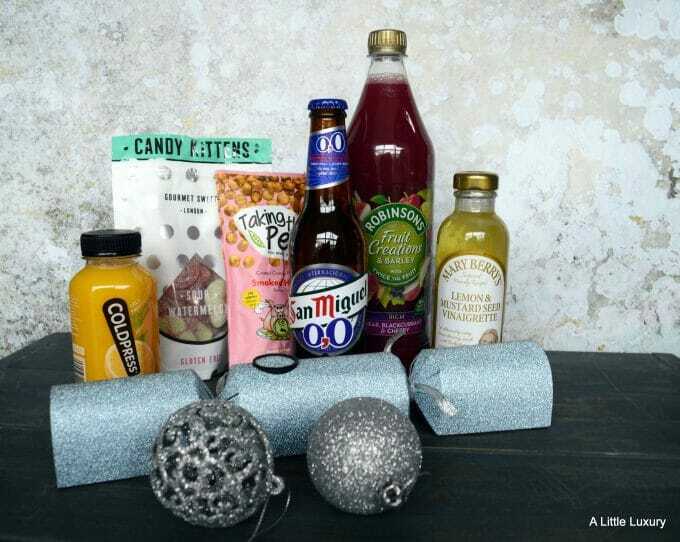 It’s been a real treat to get the December Degustabox so close to Christmas with all those wonderful goodies inside. Nuts are part of the Christmas experience, but I like them as a quick and easy snack when I am out and about too. These handy packs from Planters make that really easy and they are full of nutrition and energy. 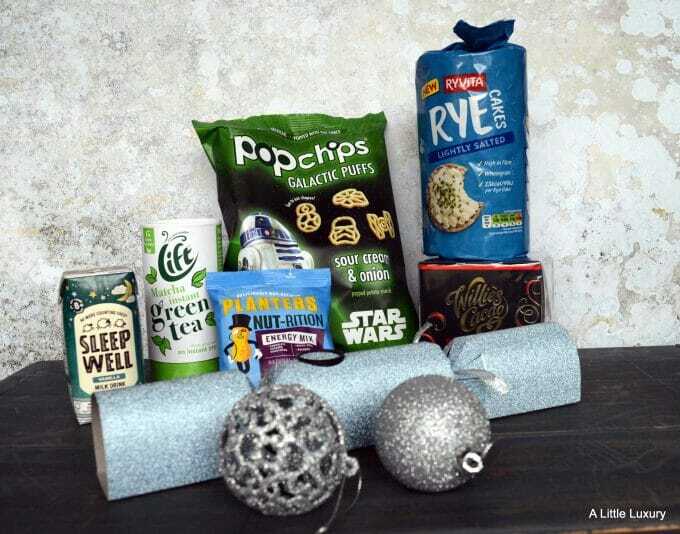 Star Wars is everywhere at the moment and my very own Star Wars fan has his eye on these Popchips Galactic Puffs. They are a light and airy snack made into Star Wars’ shapes. We are big fans of rice cakes here, so we are enjoying trying out these Ryvita Lightly Salted Rye Cakes as an alternative. The biggest treat for me though of this month’s box are the Willies Cacao Black Pearls. They are pearls of single estate chocolate containing cascades of molten caramel, so they are made from the best quality raw materials. Sleeping well is something I struggle with. I go through good phases like now when I get 8 hours sleep and wake up feeling rested. Then I’ll have a phase of waking about 4am and being unable to get back to sleep. When my sleep is bad I try all sorts of things to try to improve it and I’m looking forward to trying Sleep Well as part of that arsenal of tactics to help me sleep. You can enjoy this milk-based drink hot or cold and it helps you feel relaxed and sleepy. The benefits of Matcha Green Tea are well-known so I’m enjoying this simple to make version from Lift: Matcha Instant Green Tea. More treats in the box too in the shape of Candy Kittens Gourmet Sweets. These come in some grown-up flavours like Sour Watermelon. Taking the Pea are an easy to carry around savoury pea snack. They are a great healthy snack as they contain more protein than crisps and less fat than nuts, and they are tasty too. I hadn’t realised that Mary Berry had branched out into food products, but I’m loving her Lemon & Mustard Seed Vinaigrette. It’s a really zesty salad dressing. On the drinks front there’s lots to enjoy too. For the designated driver there’s San Miguel 0.0% which has all the flavour of San Miguel without the alcohol. I like to drink fruit juices if I’m not driving and Coldpress have some lovely ones. They use cold pressure to extract their juice and don’t use heat pasteurisation, which keeps the vitamins and nutrients (and the great taste) in. A good cordial is a great drink for adults and children alike. We like this Robinsons Fruit Creations one which is packed full of fruity flavours. You can order your own Degustabox here. 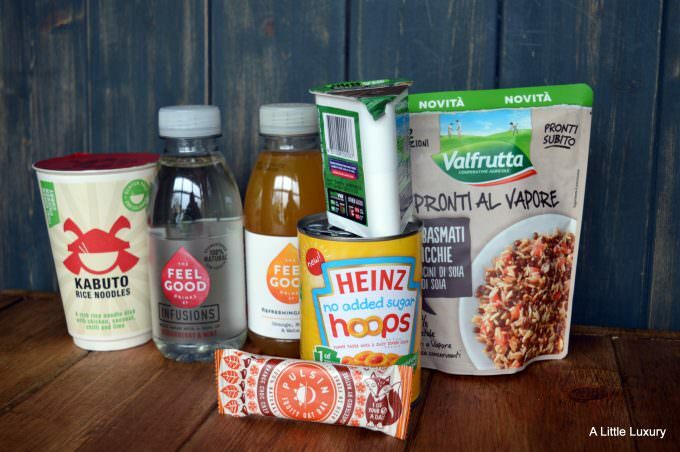 It’s a great way to try out new food and drink products. This year I’ve been trying to take more care of myself. I feel like I’ve been exhausted for the last 10 years thanks to a range of things, including getting up too early to take care of my child, but also the demands of daily life and work. This year I’ve had the chance to rest a little and get the odd lie in, but I’m aware that there is more to taking care of yourself than just getting sufficient rest (although that does help a lot!). Biocare decided to help me out a little with the self-care and sent me a package of goodies through including some of their products. A multivitamin and mineral capsule is a good way to boost health and the immune system if you have been feeling a bit run down. I backed that up with the Everyday BioAcidophilus and what I like about this capsule is that it doesn’t need to be kept refrigerated, so it’s really easy to take. Zinc Citrate to round things off and this type of zinc supplement is easy to take as it has a high absorption rate. Zinc is good for healthy bones, skin and hair so it’s a good one for helping you look your best over the party season. It’s difficult to be sure of what makes you feel better when there are so many variables in life, but I have felt like I’ve had more energy since I started taking the supplements. Alongside my Biocare supplements I’ve been trying to walk more and I’ve continued with my yoga classes, plus I’ve tried to do some at home too. As well as that I’ve been trying a little meditation every day and I think this is helping me sleep better. What do you do to help you stay fit and healthy? Do you have any tips that work for you? I’ve teamed up with Biocare to offer readers the chance to win some supplements of their own. I have a month’s supply of BioCare Everday BioAcidophilus and BioCare Red Berry BioMelts to give away. Enter via the Gleam widget below. 6. Competition closes on 14th January 2018. The arrival of the monthly Degustabox always leads to a bit of excitement in our house. There’s usually something new to try, in fact quite a few things. We like to see what we like and what we might like to buy in the future. The Nuttvia Breadsticks Snackpack was virtually inhaled by my son not long after this picture was taken. Unsurprisingly the combination of breadsticks with chocolate and hazelnut spread went down incredibly well. Feel Good Drinks Water Infusions were for me to enjoy. I have to say I preferred the Orange, Mango and Water to the Strawberry and Mint. Kabuto Noodles Thai Green Chicken Curry are a favourite lunch time treat – they are so quick and tasty too. The Pulsin Kids’ Fruity Oat Bars Orange Choc Chip made an appearance in my son’s lunchbox and the empty wrapper was returned which is good news as anything not eaten usually comes back. I like that it doesn’t contain too much sugar (for a fruit snack) and it’s high in fibre too. When the Heinz No Added Sugar Hoops came out of the box, I realised that I hadn’t introduced my son to hoops at all, so we were soon able to put that right. Valfrutta offered a ready to eat Mediterranean meal. I had the Basmati Rice & Lentils and it was very tasty – so convenient too. I was so pleased to see the Hippeas Organic Chickpea Puffs as I’ve had these before and they are very moreish. Likewise my son was chuffed to bits to see Pechkeks Misfortune Cookies for the same reason. We’ve had a box before and he was very taken with them – they are a slightly different take on the fortune cookie and recommended for Halloween or if you just want a bit of fun. I’m afraid I’ve never been that keen on Vimto, but my brother loves it and he was very happy to try this Vimto Millions Gift Jar and gave them the thumbs up. We had some spare ribs in the freezer so we dug them out for the Lee Kum Kee Sauce For Honey Garlic Spare Ribs and they were delicious. We also got a Lee Kum Kee Sauce For Tomato Garlic Prawns which we have yet to try. Now my son is adding salt to his food it’s good to have a healthier alternative available so we were happy to try the LoSalt, which has 66% less sodium. A couple of very moreish treats to finish on. Pip’s Real Hot Chocolate Co Real Hot Chocolate Coins make delicious hot chocolate and are so easy. They were the perfect match for Michel et Augustin‘s oversized cookies with chocolate chips. You know when you haven’t done something for ages, you can forget how good it is to do. 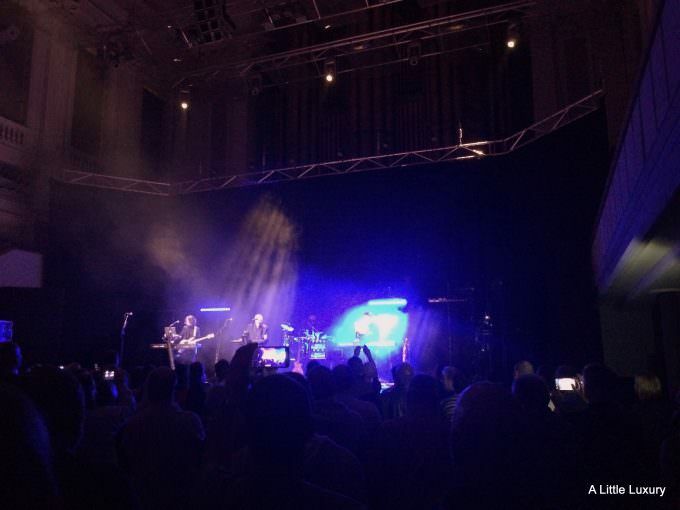 A few weeks back I received a phone call telling me I’d won some tickets to see Midge Ure at Birmingham Town Hall. I put it in the diary, lined up someone to go with and forgot about it until this week when I could see it there in the diary. A bit of quick research on the Birmingham Town Hall site revealed that it wasn’t just Midge Ure we were going to see, but The Christians and Altered Images too, so quite a fest of 80s music really. This made the evening out a lot more exciting as seeing three bands rather than just one artiste has got to be good, assuming the bands are high quality. The advantage of a three band bill, as we found out is, that you will know almost all the songs. With only a short time on stage each, it tends to be the fan favourites that come out with only one or two other songs per set. This was perfect for us as whilst we liked all three bands we weren’t committed fans of any of them. It’s difficult to pick a favourite out of the three, so I won’t. 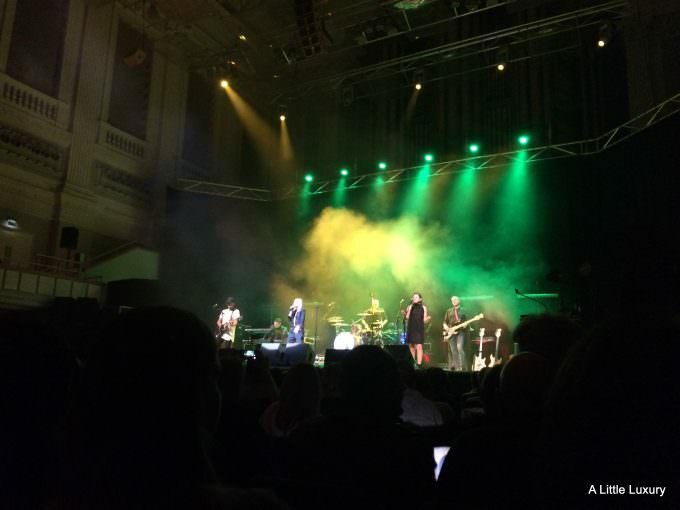 I loved Altered Images and their quirky pop songs which started the evening on a happy note. Clare Grogan has lots of energy and I enjoyed her banter with the audience. The Christians had apparently had a few drinks (they told us so), but it didn’t impact on the music. Their set covered their biggest hits and got most of the audience up and dancing. Of course, Midge Ure was the biggest act of the three and had the longest set. I was surprised how many songs he’d written that I knew including some for other bands. He played a number of Ultravox songs, some of his solo hits and Fade to Grey (a Visage song that he’d co-written). I think I’ll be looking out for similar lineups in the future. It’s great to see some live music and getting to see three eighties bands in one night was quite a treat. Vegan food is really on the up in Birmingham and I’ve been invited to sample the cuisine of a few vegan establishments in recent months. I’m finding within my circle of friends that more people are adopting the vegan diet or simply incorporating more vegan food into their lifestyle these days. After all as my dining companion, my 10-year-old son, said ‘vegan food is just food’ and it is that simple. 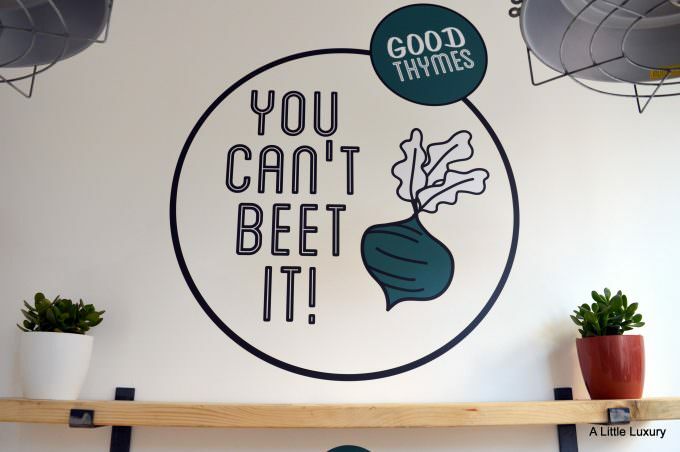 There’s every reason to try to include some vegan options in our diets whether it’s for health reasons, animal welfare concerns, thinking of the environment or just fancying a bit of a change. Fressh has recently set up in City Arcade (right at the Union Street end near W H Smiths, Sainsburys and Poundland). It’s really centrally located so it’s perfect if you want a bite to eat while you are out shopping or you pop out of work for some lunch. Sit by the window if you fancy doing a little people watching while you eat, but you can take away your food if you prefer. The decor is really ‘fresh’ too with lots of white and clean lines. In fact, we got a really fun, fresh vibe from the cafe. The menu is simple and pared down. Until 11am there’s a breakfast menu available which looked interesting, but we were there for lunch. We liked the names of the burgers: I had a What the Guac and my son had a Son of a Bun. We paired up our burgers (which can be gluten-free on request) with some Baked Skin On Fries, but there are also Baked Kale Fries available. Our burgers were packed full of flavour and they made a good hearty lunch, which we needed as we had been doing plenty of walking that morning. We certainly didn’t miss the meat or the dairy products. To wash our food down I had the Organic Coconut Water which I find very hydrating without making me feel I have water sloshing around inside. My guest for the day had Homemade Lemonade, a traditional lemonade with lots of lemony flavour which is just the way he likes it. The staff are friendly, helpful and eager to please. From what I overheard when I was eating they seemed knowledgeable about the food and able to answer any questions. I first encountered Hilary Leach‘s therapy skills, probably somewhere around 13-15 years ago. As it happened I just rang a clinic that I knew of locally and ended up having an appointment with Hilary, but I quickly realised that I’d got lucky with that call. At that time I’d go along for the occasional treatment to help me destress after a day taking the sort of flack that a manager in the financial services industry tends to take. It really helped. Sometimes I’d have an aromotherapy massage and other times I’d go for reflexology. On other occasions I’d go to help clear a persistent ailment with an Indian Head Massage or Hopi Ear Candles. When I was pregnant I had treatments with Hilary regularly, which was a welcome treat and really helped me through my pregnancy. 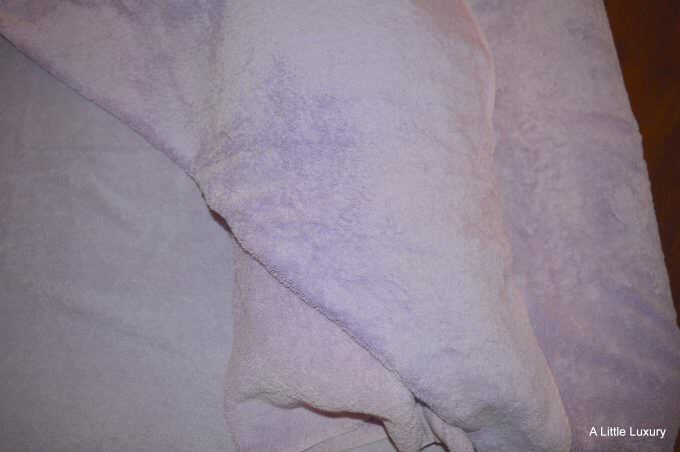 I had few problems with my pregnancy, despite being an older mother, and I put some of that down to the care I received from Hilary during that time. 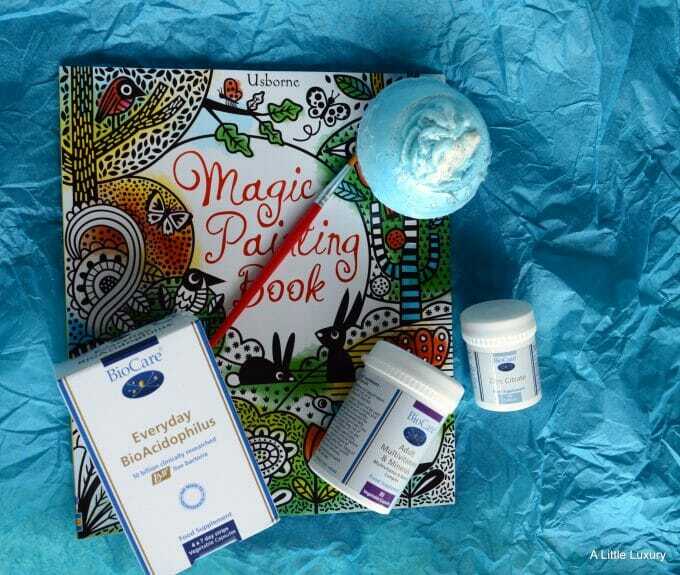 In fact, we followed a programme of treatments which led to me trying out some new (to me) therapies, including the Bowen Technique and Reiki Healing. Hilary has studied and gained qualifications in a wide range of treatments and is quite a specialist in treating pregnant women and those trying to conceive. Many therapists don’t have the right qualifications and expertise to treat you when you are pregnant, so it was good to be in safe hands with Hilary. After having my son H I didn’t have so much time to go for treatments, but I still managed an occasional treat. Thankfully though my stress levels have been at a much lower level since giving up my office job, until recently that is. This year things have moved up a gear or several and I have been visiting Hilary again. Her friendly manner has a way of putting you at ease and I always feel very welcome and relaxed. 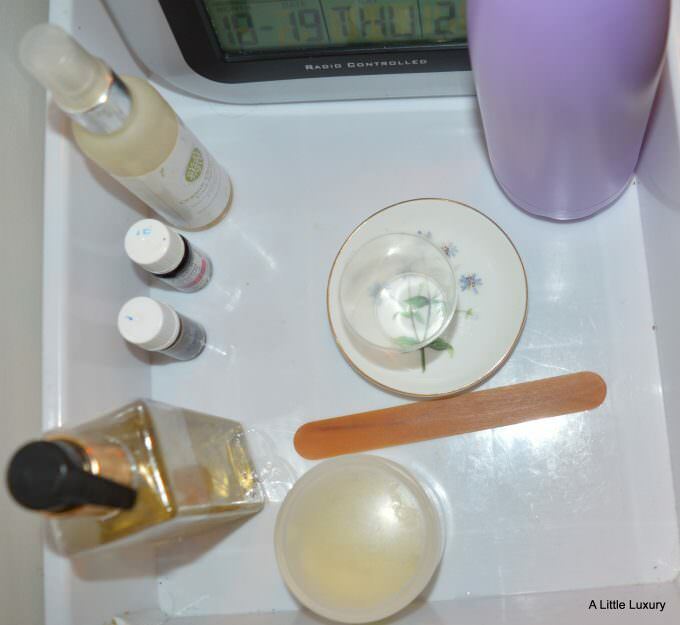 This time I went along for a massage and reflexology combo, which was great as I find it very hard to choose between these treatments as I find both really effective. I just had a back and shoulder massage to begin with and as that is where I carry a lot of my tension it was really valuable. Now that I was feeling relaxed, we moved onto the reflexology which I always find fascinating. Hilary found evidence of tension in my neck which I wasn’t surprised to hear. There was an area on my feet though that felt really tender when Hilary reached that part and it related to my adrenal glands, which given my stress levels isn’t perhaps so surprising. She also tried some of the Bowen Technique moves for tennis elbow on me and they did seem to have some effect and I’m now wondering if I shouldn’t book in to have a proper treatment session for that. Hilary Leach is based in Harborne in Birmingham. 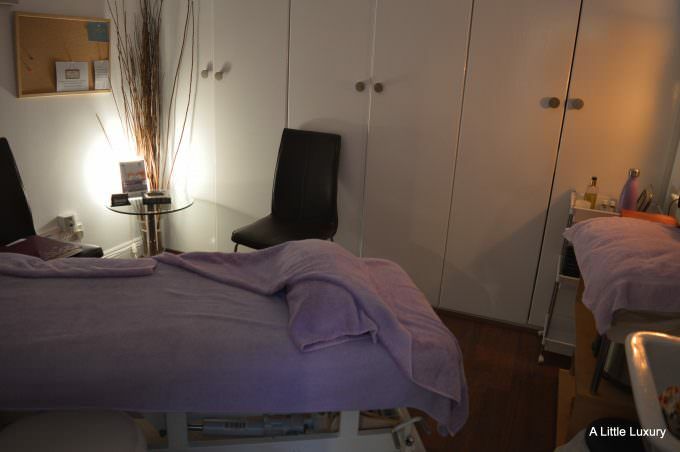 She provides a wide range of different treatments including relaxation packages. If you are looking for a thoughtful gift, you could consider one of her gift vouchers. 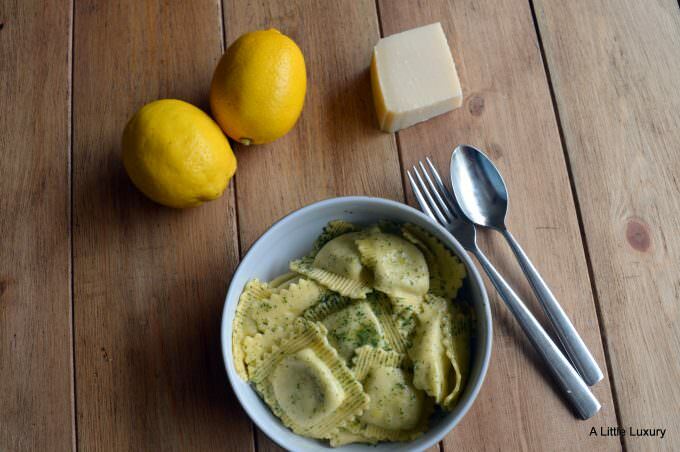 Filled fresh pasta is a bit of a family staple in this house and it makes a quick and easy meal, when we are short on time. I love the fact that they are cooked almost instantly and usually they don’t need a lot of sauce because of the filling. Dell’ Ugo send me some samples to try and we tried them out for a family meal. I think though that they are a bit of a grown up sort of taste experience and would be better served to adults. 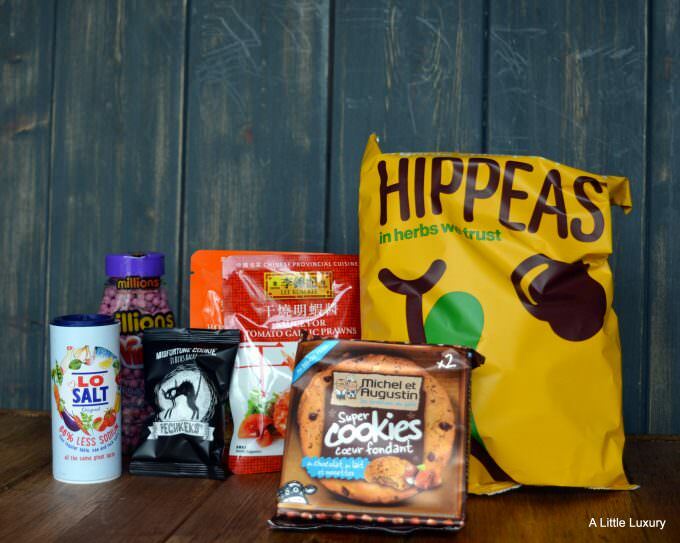 There are some strong tastes and flavours in the range and they might not suit children. My pick of the bunch was the Asparagus and Mozzarella with Lemon Butter. These ingredients are basically some of my favourite foods and it’s a great combination of flavours. The pack came with the filled fresh pasta and a little pack of flavoured butter. After you have drained the pasta, you melt the butter in the pan and return the pasta to the pan to coat the parcels with the sauce. 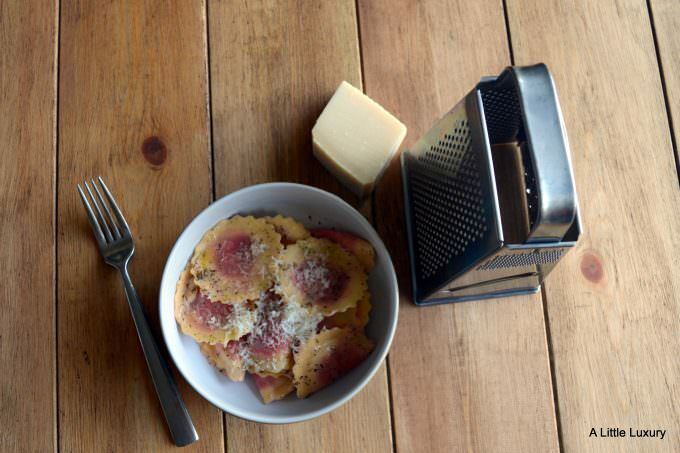 Then serve with parmesan and/or black pepper to your personal taste. I really enjoyed this bowl, although there was slightly too much butter for me and I didn’t feel I needed any parmesan. Next up was the Goat’s Cheese and Beetroot with Mint Butter variety. This was less successful for me. There was too much butter by quite a long way so it was very greasy and with parmesan as well it was over done. I wish I’d left the parmesan off as you don’t really need it with the goat’s cheese. 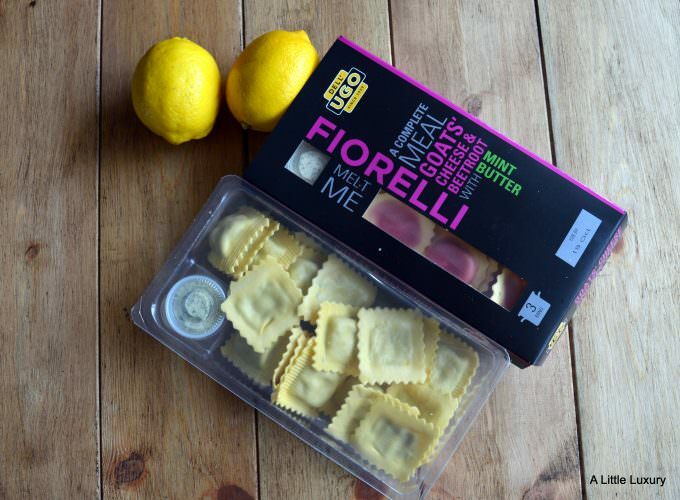 There are 5 fresh pasta meals in the Dell’Ugo range, so there will be one to suit most people. I liked the fact that you don’t need to buy a separate sauce. It all comes included.